John Kerry: A 'Basis' For New Israeli-Palestinian Talks : The Two-Way The details have not been finalized, but the sides appear close to resuming full-fledged negotiations after years of stalemate. 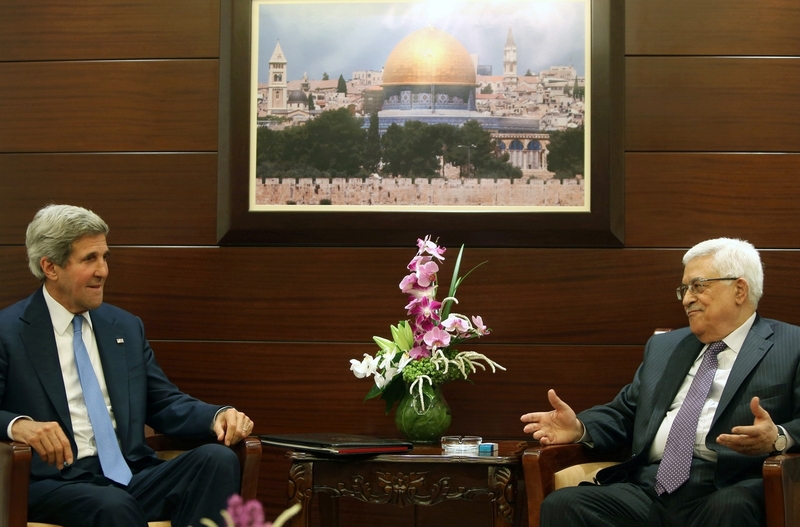 Secretary of State John Kerry meets with Palestinian President Mahmoud Abbas in Ramallah, West Bank, on Friday. Shortly afterward, Kerry announced a "basis" for the Israelis and Palestinians to resume peace negotiations. Nothing ever seems to come easy in the Middle East, but Secretary of State John Kerry said Friday that there was "a basis" for a new round of Israeli-Palestinian peace negotiations, which would be the first such talks in several years. Kerry made the announcement in Amman, Jordan, after a series of discussions with Palestinian and Arab leaders. "We have reached an agreement that establishes the basis for resuming direct final status negotiations between the Palestinians and the Israelis," Kerry said. "This is a significant and welcome step forward." One sticking point for new negotiations appears to be the Palestinian demand that the 1967 borders be the starting point for any talks. Israel has negotiated on this basis in previous talks. However, Prime Minister Benjamin Netanyahu's government says Israel will never accept a return to those borders, arguing that the country would not be secure. The Israelis and Palestinians have been holding periodic peace talks for the past two decades without achieving any major breakthroughs. All the toughest issues still remain: the status of Jerusalem, the fate of Jewish settlers in the West Bank, security arrangements and the borders of a future Palestinian state. Senior Israeli and Palestinian figures are expected to come to Washington in the next week or so to work on the final details for resuming negotiations. Kerry has been pushing hard to resume the talks, making six visits to the region since he became secretary of state earlier this year. Kerry said he was optimistic, though the atmosphere for resuming Israeli-Palestinian negotiations does not appear to be particularly promising. Syria's civil war is raging, destabilizing the region and sending refugees flooding into Jordan, Lebanon and Syria. Egypt is still in political turmoil following the military's ouster of the president, Mohammed Morsi, earlier this month. These developments, along with other upheavals in the Middle East in recent years, have made Israel hesitant to make any major moves. In addition, Netanyahu, while endorsing a Palestinian state in principle, has shown little enthusiasm for negotiations during his past four years in office. The Palestinians, meanwhile, remain deeply divided. Abbas and his Fatah movement control the West Bank, while the Islamist group Hamas runs the Gaza Strip. Hamas has always refused to negotiate with Israel, raising questions about how any agreement between Israel and the Palestinians would be implemented.